Painted like a bird with feathers. One of the first aircraft designs to use winglets. One of the world’s first flying wings. Tailless, with a crew of three — a bomber. Is that a Japanese roundel? Correct! 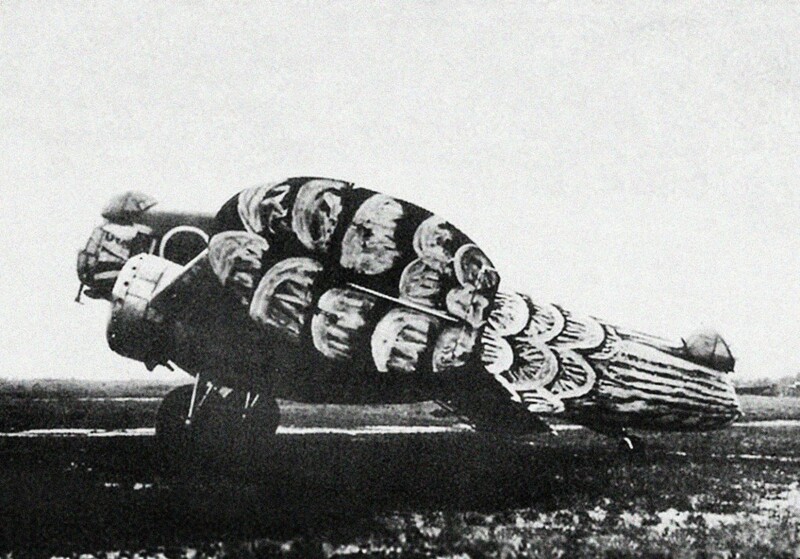 This is the Kalinin K-12 “Zhar-Ptitsa”, aka “Fire Bird” (a Soviet variation of the mythical phoenix from Western literature). The aircraft was designed and built by Konstantin Kalinin, one of the inventors of the elliptical wing, an innovation that was hailed as one of the greatest contributions to aviation at the time (in the late 1920s). The K-12 was both a bomber and passenger airplane and was demonstrated in 1936 at Tushino Airfield near Moscow, where it was painted in wild red and yellow colors for public relations purposes. Sadly, Kalinin did not survive the 1930s, like many of his compatriots, he was sent to his death in a work camp by Stalin when he fell out of favor in 1938.